Thurmon King's database, 19301 Norman Sackett. "US, National Homes for Disabled Volunteer Soldiers, 1866–1938", digital image, Ancestry.com, 3267, "Norman A Sackett, enlisted Meriden, Conn, Nov 14, 1861, Pvt, 1st Conn Batt Lt Art, discharged Washington DC May 2, 1864, re-enlistment in Vet Res Corps, Washington DC May 3, 1864, Pvt, Co A, 9th Vet Res Corps, discharged Washington DC Nov 16, 1865, expiration of service, disability: var veins both legs, hernia, contracted Watertown, Dak, Oct 1887. Born Ohio, age 65, 5'10", fair complexion, blue eyes, gray hair, school teacher, res. Sioux Falls, Dak, widower. Admitted to home Jan 15, 1889, died June 15, 1889, scirrhus, cancer of liver." "US, Burial Registers, MIlitary Posts and National Cemeteries, 1862–1960", digital image, Ancestry.com, Death Register, Western Branch NHDVS, "Norman A Sackett, 1 Conn Lt Art, d. 15 Jun 1889, aged 65, scirrhus cancer of liver, bur. Leavenworth National Cemetery, Kansas, grave 255." 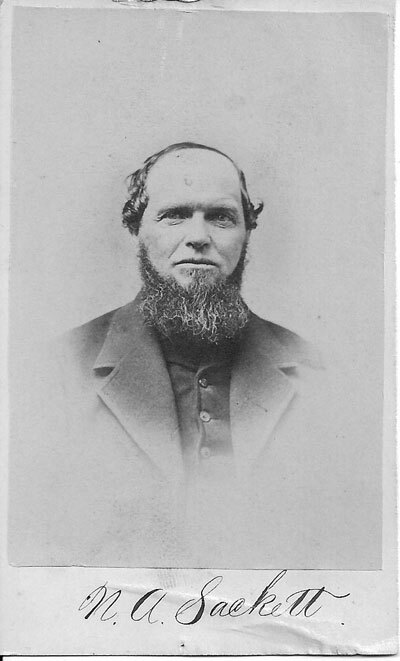 Barbour Collection of Connecticut Vital Records, "Sackett, Norman A., of Ashland, O., m. Julia Jenkins, of Sharon, Aug. 25, 1851, by Rev. Charles Rockwall. Sharon Vital Records, LR27:545." [in household of Lemuel Merchant, 56, a farmer]. Sackett, William, 3, b. CT.
Record of Service of Connecticut Men in the Army and Navy of the United States during the War of the Rebellion, Press of The Case, Lockwood & Brainard Company, Hartford, Conn (1889), History of the First CV Light Battery, 103, Privates, "Sackett, Norman A, of Bloomfield, enlisted Oct 15, '61, mustered Nov 14, '61, Trans. to unassigned detachment V.R.C. Feb 25, '64. Re-en Vet. May 3, '64. Trans to Co. C. 11th Regt. V.R.C. Trans to Co. D. 12th Regt. V.R.C. Trans to Co. A, 9th Regt. V.R.C. Disc. Nov 16, '65."